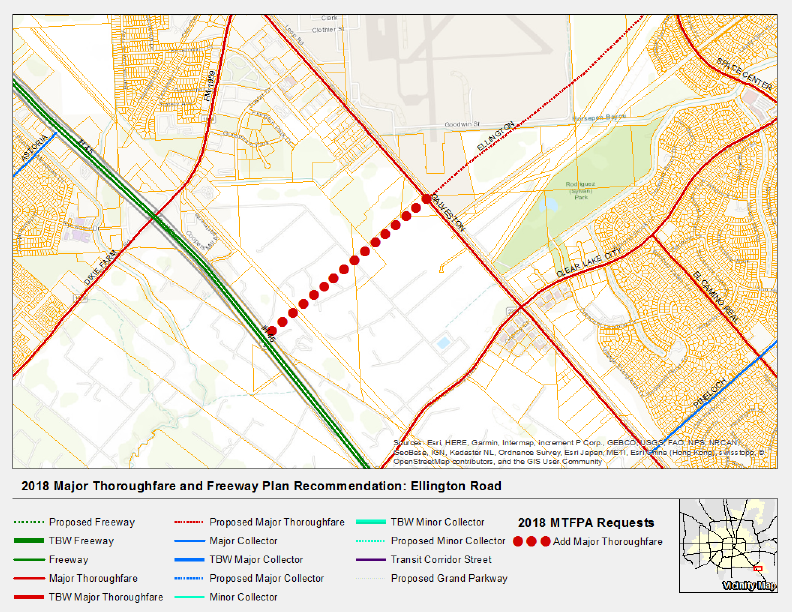 The City of Houston is proposing to add Ellington Bypass, a major thoroughfare, between Old Galveston Road and IH-45 to the City’s Major Thoroughfare and Freeway Plan (MTFP). The MTFP identifies right-of-way needs and proposes roadway alignments within the city limits of Houston and its Extraterritorial Jurisdiction (ETJ). The MTFP does not initiate the timing of right-of-way acquisition or construction activities related to the roadways. Ellington Bypass between Space Center Boulevard and Old Galveston Road was added to the MTFP in 2003. Property owners abutting the proposed road alignment will receive written notification of the amendment process early next week. To submit comments to the Planning Department regarding this amendment, please send an email to mobility.planning@houstontx.gov. Information on the proposed amendment will also be available for public review at a townhall meeting hosted by City Council Member Martin to be held on Tuesday, October 16th, 2018. Sharon Moses Burnside with the Planning and Development Department (P&D) will make a short presentation and will be available to answer questions and take comments before and after the meeting. After considering information provided by property owners, the public, City staff and other government agencies concerned about transportation in our region, the Houston Planning Commission will vote on the proposed amendment at their regularly scheduled meeting on November 8th. If approved, the proposal will be forwarded to City Council for consideration by the end of the year. You may contact the Planning & Development Department for more information at 832-393-6660 or mobility.planning@houstontx.gov . Notice of the open house and public hearing will be mailed to affected property owners in early September of 2018. A Planning Commission public hearing will be held at City Hall Annex, Council Chamber (900 Bagby Street, Houston TX 77002). This is an opportunity for concerned citizens to speak in support or in opposition to the proposed amendments. The Planning Commission will consider taking action on each application. The Planning & Development Department will forward the proposed changes to the 2017 MTFP map to City Council for adoption. Planning & Development (P&D) Dept.